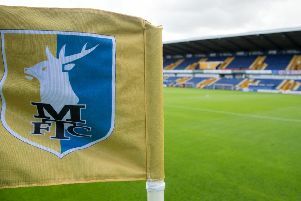 Rakish Bingham said all the Mansfield Town players were fully behind new manager Adam Murray and enjoying his style of football. Striker Bingham marked his recall into a 4-4-2 line-up with the opening goal in yesterday’s 2-2 FA Cup round two draw at Cambridge United in Murray’s first game in charge after being given the job full-time on Friday. “It’s been a while since I scored,” said Bingham. “I’ve been a bit goal-shy. So it’s wonderful to get a goal and help the team. “We have come a long way in a short spell and we are disappointed not to hold on for the win here today, though the most important thing is that we are in the hat for the next round and that’s all we can ask for. “There is a new buzz in the dressing room. It’s been like a breath of fresh air and we are all behind Muzz. “He has brought a new style and a new approach. He wants us to get the ball down and play at a quick tempo. “Everyone is buying into it and it’s a great feeling. “We have the players to play the style he wants to play. It is a natural thing to buy into it. Bingham headed Stags in front on three minutes, though wasted another good chance later on when he sent a free header over from six yards. “We worked on the formation during the week and I played in the reserves on Tuesday in that position, though I know it very well,” he said. “I have had to be patient for my chance and then needed to take it when I got it, which I think I’ve done today. “My goal was brilliantly worked. I think it was Vadaine (Oliver) to Rob Taylor and I couldn’t do anything else but score, his ball in was that good. “It is my job to score goals but it was a brilliant feeling.